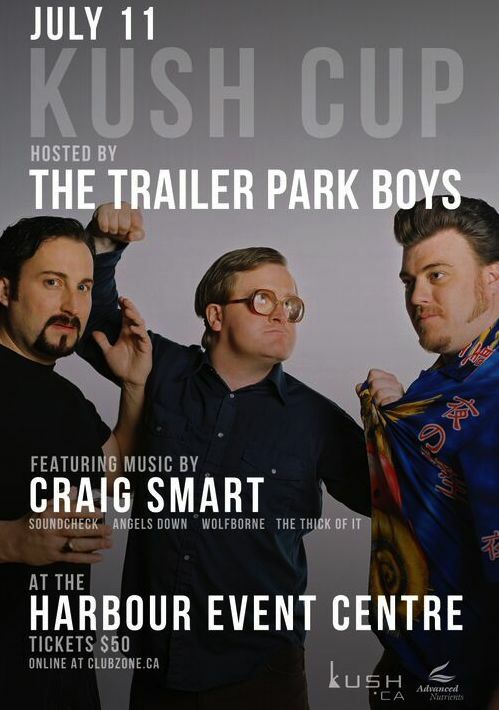 POT TV – The Trailer Park Boys will host The Kush Cup 2015 in Vancouver THIS WEEKEND. Watch it LIVE on Pot TV starting at 4PM PT Friday with Cannabis Culture News LIVE. The Kush Cup – a marijuana strain judging competition that includes live music, comedy and a boat cruise – is back from July 10 to 12 in Vancouver. Ricky, Julian and Bubbles will perform on Saturday July 11 at the Harbour Event Centre, with music by Craig Smart, Soundcheck, Angels Down and more! 4PM – Ticket pick-up begins at world-famous Mega Ill. Enjoy a dab and a slice. 12PM – Boat Cruise 1 (with The Trailer Park Boys) boards at Granville Island free parking lot. 3PM – Boat Cruise 2 (with The Trailer Park Boys) boarding at Granville Island free parking lot.